Because of his undying love for acorns, Scrat makes an astounding discovery that sends him deep into the black and endless space; however, his actions have consequences of cosmic proportions. Will he stay forever stranded in the void? Amid the boundless ice-cold ocean, the fortunate survivor, Scrat, finally finds a tiny islet, willing to go to great lengths to get his precious acorns; however, all that glitters is not gold. Will Scrat ever learn? Scrat's pursuit of his acorn causes the earth's land to split into different continents. Only one sweet and shiny little acorn separates Scrat, the tireless prehistoric sabre-toothed squirrel, from the perfect stash of provisions. However, when enough is enough? On becoming aware that Sid is their camp counselor, the children quickly realize that Sid may not be qualified for the job. Scrat's ever-going search for acorns leads him to a girl. However, she has an acorn with her. What will Scrat choose - survival or love? 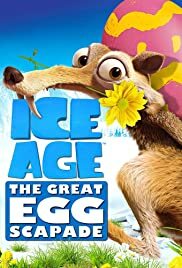 In Ice Age: The Great Egg-Scapade harried prehistoric bird mom Ethel (Taraji P. Henson, EMPIRE) entrusts her precious, soon-to-hatch egg to Sid (John Leguizamo). When she recommends him to her neighbors – a condor mom (Wendy Williams), Cholly Bear (Gabriel Iglesias) and Gladys Glypto (Lili Estefan) – business booms at his new egg-sitting service. However, dastardly pirate bunny Squint (Seth Green, FAMILY GUY), who is seeking revenge on the ICE AGE gang, steals, camouflages and hides all the eggs. Once again, with Squint's twin brother, Clint (Blake Anderson), assisting, Manny (Ray Romano), Diego (Denis Leary) and the rest of the gang come to the rescue and take off on a daring mission that turns into the world's first Easter egg hunt.